Patna, March 20: RJD leader Tejashwi Yadav has denied reports of a deadlock over seats in the "Mahagathbandhan" (Grand Alliance) in Bihar, saying it has been finalised and will be announced after the Holi. "The Grand Alliance is intact. There is no problem over seat-sharing. We have finalised everything. After Holi we will formally announce seat-sharing as well as candidates", Tejashwi said, here on Wednesday, on return from New Delhi, where he was camping for the last several days for finalising seat-sharing pact with top Congress leaders, including Rahul Gandhi. Tejashwi, former deputy chief minister, said talks over the seat-sharing pact concluded on a positive note. "There is nothing to worry. Everything is well in the Grand Alliance". According to sources in the RJD and the Congress, the seat-sharing pact was finalised on Tuesday night after a talk between Tejashwi and Congress president Rahul Gandhi in New Delhi. The RJD and the Congress have reached an agreement, after bargaining for days, with both deciding to compromise on the number of seats, an RJD leader said. "The Congress is likely to contest 9 of the 40 Lok Sabha seats, the RJD 18 or 19, and the remaining seats will go to smaller allies", he said. The Grand Alliance comprises old allies like the Congress and the RJD, and new entrants such as the Rashtriya Lok Samta Party (RLSP), the Hindustani Awam Morcha (HAM), the Loktantrik Janata Dal (LJD) and the Vikashsheel Insaan Party (VIP). 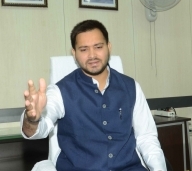 Tejashwi said he and the Rashtriya Janata Dal (RJD) have decided not to celebrate Holi this year in view of the Pulwama terror attack in which 40 CRPF jawans were killed.